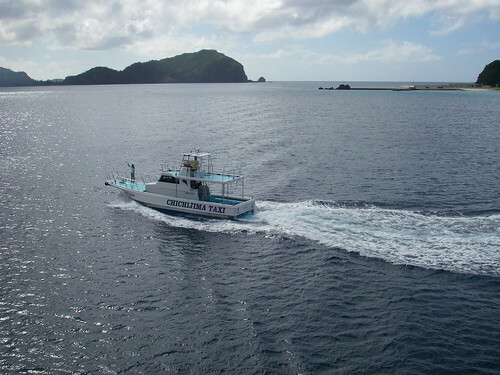 In my last Ogasawara post I introduced the islands, described how I came to be included in a free trip there, and wrote about the long journey from Tokyo. 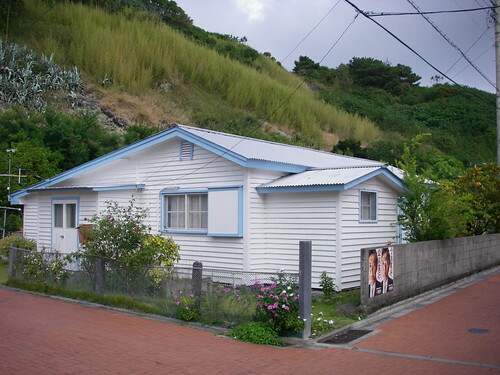 This post is about my first day on the main island, Chichijima. We'd been on the ferry from Tokyo for twenty five and a half hours, exactly as scheduled, when we finally entered Futami Harbour, the main port of Chichijima. 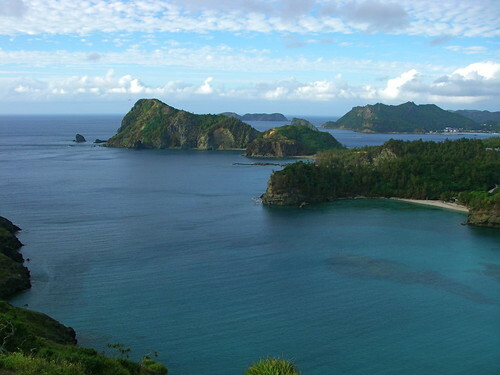 Chichijima is the largest of Ogasawara's thirty-some islands and is home to about 2000 permanent residents. As we neared the dock a little boat came out to great us, its crew waving as it circled our ferry. It was kind of a nice way to be welcomed to the island but I just assumed it was a cheesy advertisement and put it out of my mind until a few days later, when the boat was part of a much more impressive display. I may have had overly high expectations, but was kind of assuming the island would have a distinctly tropical atmosphere and was slightly disappointed to see the same tetrapods and concrete as on the mainland. It by no means looked like Tokyo, yet it also didn't feel like I'd left Japan. And of course I hadn't left Japan (if fact we technically hadn't even left Tokyo), but I had expected I'd feel like I had. I'm not terribly well-traveled, but when I've stepped off the plane in places like Jamaica, Bali or Okinawa I've felt instantly that I had arrived somewhere very different and very special, someplace with its own vibe. 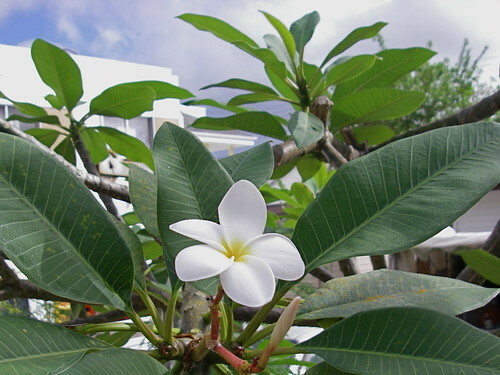 Things looked different, people talked differently, even the air felt different: hot and tropical and sweet-smelling. But I didn't have that feeling as I stepped off the ferry. 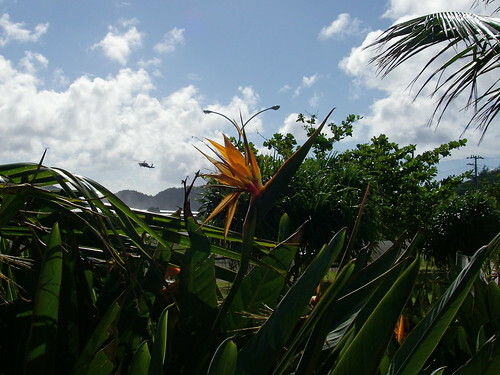 It was probably due more to the mode of transportation than the island itself: an airplane landing is much more dramatic than the arrival of a ferry, which after all has been chugging alongside the islands for hours, acclimatizing its passengers long before docking. And to be fair, there was one clue that we were on a semi-tropical island: it was hot. I had long since packed away my winter jacket but now even in my short sleeves I was sweating. As we waited to regroup and meet our hosts I watched the ferry empty itself of passengers and cargo. There was an awful lot of it, mostly in the form of shipping containers. We later learned that the ferry operates at a loss as a passenger vessel and is only kept in business to deliver cargo (and even then it relies on government subsidies). We were met by various Tokyo government workers and local tourism folks who whisked us off to lunch. On the way things started to look a little more exotic: the streets of Tokyo are definitely not lined with birds of paradise. I was also surprised to see a helicopter landing, above, and I'm sure I wasn't the only one who wished we'd arrived by air rather than sea. Apparently helicopter access is restricted to military and medical use, though. Lunch was at a restaurant called Charlie Brown. We were served egg drop miso soup and a plate of, from bottom left: mekajiki no tatsuta-age (deep-fried swordfish), a salad including shikaku mame (wing bean, a vegetable most often found in South East Asia but also popular in Okinawa and Ogasawara), tuna sashimi, spaghetti napolitan (Japanese retro-style spaghetti with tomato sauce), and pork sauteed with onions and mushrooms. 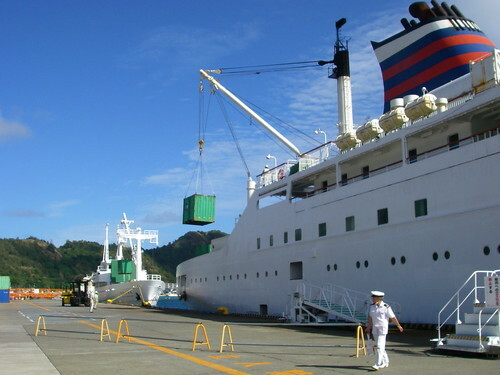 We estimated that almost all of the food was imported from the mainland, except of course for the shikaku mame. This by the way was the "omakase salad" which would have cost 800 yen if I'd been paying my own way (like all meals during the trip this was pre-arranged and the food ordered for us). It was tasty but a bit too heavy for the first meal after a long ferry trip. 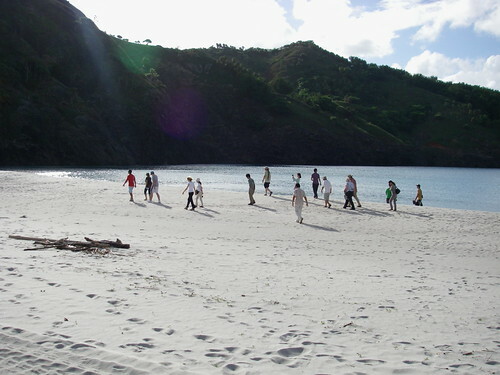 We were given a short bit of free time, which the guys smartly used to hit the beach. With my full tummy I preferred to tag along with the ladies who were checking out the village in search of shopping opportunities. 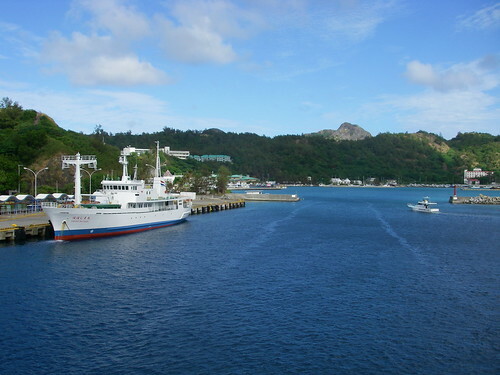 The port is in Ogasawara Mura, the main village, which consists of a few streets lined with shops and restaurants for tourists and locals alike. There are also regular folks' houses scattered here and there,and it was neat to check out peoples' gardens. 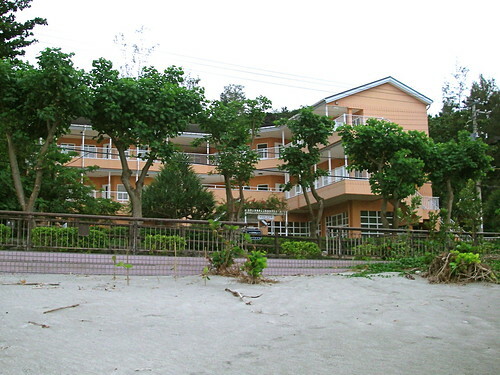 Some of the houses, like the one above, reminded Helen of those found in New Zealand. Up close, I had to admit that this place was quite tropical and exotic, and if I was still having trouble detecting a distinct Chichijima atmosphere, at least it felt different from Tokyo. The sight of Tokyo election posters and the ubiquitous vending machines were a bit jarring though. 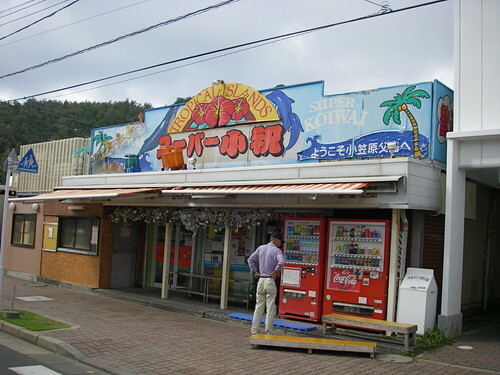 The island's supermarket was small but quite impressively stocked with exotica like dill pickles, taco shells, chutney, and other things that can be hard to find even on mainland Tokyo. 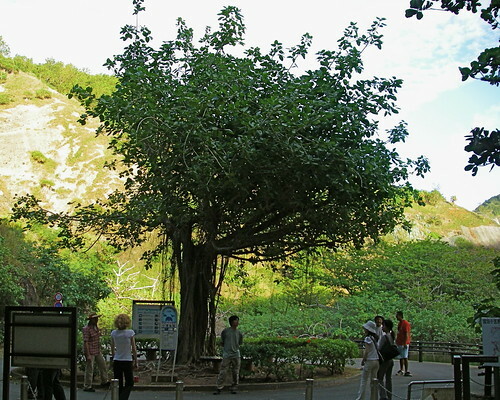 We wondered if this reflected the number of foreign visitors or the number of island locals with foreign roots. There are said to still be a fair number descendants of the original non-Japanese settlers on the island, and although most people we saw looked purely Japanese (and everyone spoke Japanese) there must be some explanation for all of the foreign food. 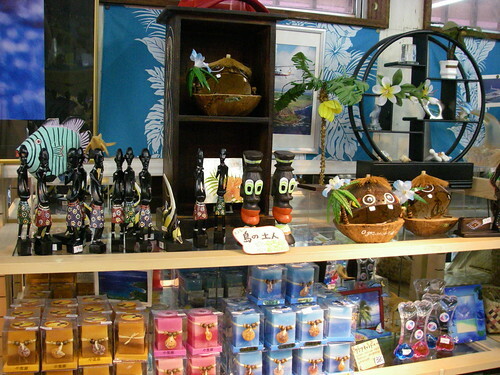 There were a few souvenir shops that lured us in with neat stuff like passion fruit jam and then repelled us with with a bunch of junk that ranged from merely tacky to downright offensive. There were also plenty of tour companies, but before we got a chance to check those out it was time to meet up with our handlers and start a tour of our own. We were loaded into a few minivans and driven a short distance south to see a WWII era shipwreck (located here on Google maps if you're interested). It was an interesting sight but as a kayak approached it from the shore we all watched wistfully, wishing we were were seeing the wreck up close rather than from the side of a road. 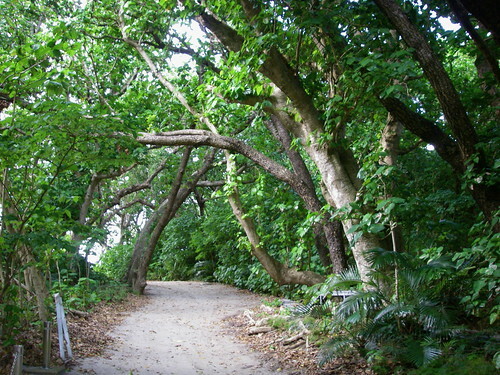 This particular road was lined not with with birds of paradise but with hibiscus bushes. I may not have been in the water but I was definitely starting to feel tropical. Next we were driven to the end of the road and got to begin a walking tour. This was the southernmost point on the island accessible by car (map here) and was itself a pretty spot, next to Yatsuse-gawa, a slow-moving river. Finally, a chance to stretch our legs, and maybe even get near the ocean. 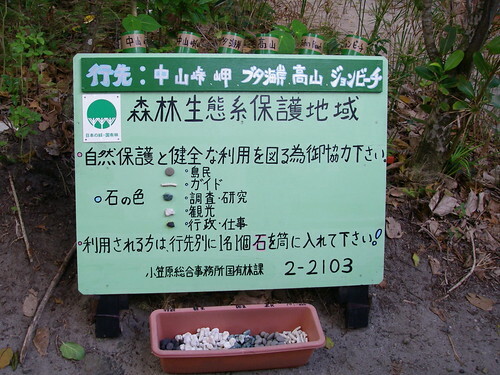 A number of trails started at this point, and visitors (or at least those visitors who can read Japanese) are meant to stop by this sign put up by a local conservation group and leave a record of where they went. 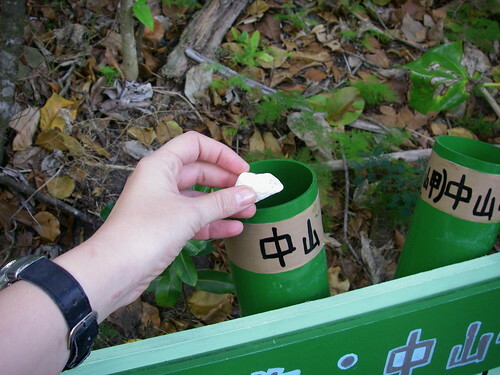 The thing to do is to pick up a particular kind of rock or piece of coral representing who you are (as in a tourist, a native, a guide, etc) and drop it into the the tube marked with your destination. 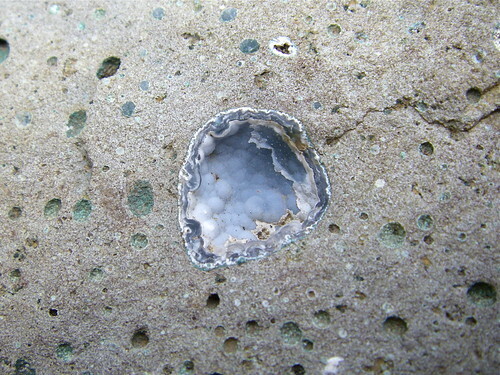 So I left a lump of white coral in the tube for Nakayama-toge (Nakayama Pass), the trail we were taking. This was definitely one of those "only in Japan" things, as in any other country people would just claim the pretty rocks and corals as souvenirs. So we started our tour, and I excitedly noticed the path turn sandy. Were we finally hitting the beach? Yup! 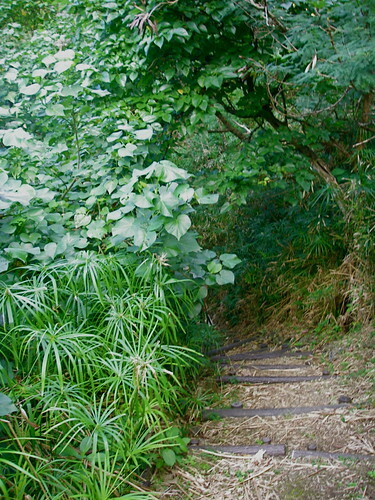 Off went my sandals as I made a run for the water, slowing down a bit to check out the little tracks above and ask our guide, Takizawa-san, what they were. He said to wait for the night tour, but I guessed that they were sand crabs and giant hermit crabs. 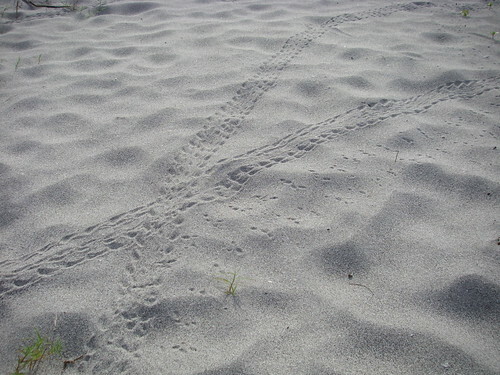 They were indeed, but I wasn't able to get a picture of the critters that night so these tracks will have to do. And then I realized that the tour was happening right here on the beach, and there'd be no chance to actually get in the water. This was a Japanese style tour, long on talking and short on fun, and although Takezawa-san was great, but the lure of the water was greater. I had to at least get my feet wet so I went as far into the water as I could while still being able to hear about the flora geology of the area. The water was a bit cooler than I expected but very nice, and it took all of my willpower not to jump in for a swim. Alas, the tour moved on and I raced back to retrieve my sandals as the group headed to the hills. 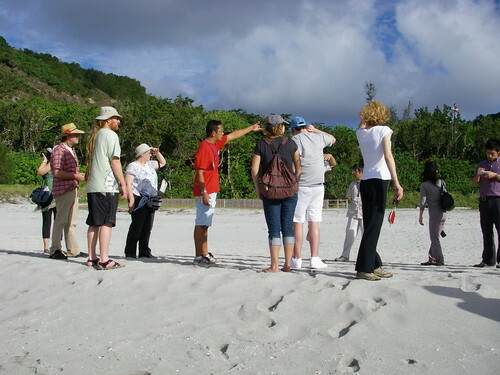 The group, by the way, consisted of ten foreign tour participants, two members of a tourism consulting company, two Tokyo government people from the mainland, three local Tokyo government people, and our guide. I think. We had so many people looking after us throughout the trip that it was hard to keep track. 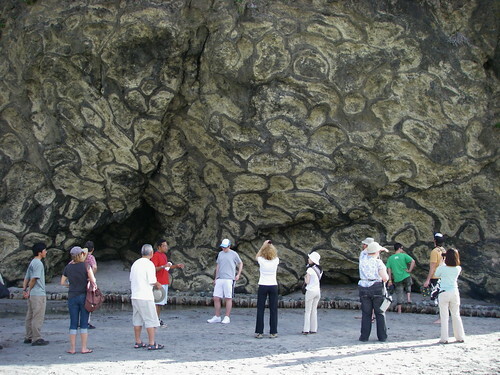 The volcanic rock that jutted out of the sand was adorned with a spectacular pattern, and now I really was paying attention. Unfortunately I didn't get much of the explanation: my Japanese ability is such that I can normally understand about sixty to seventy percent of a regular conversation, but with a geology lecture I'm hopelessly lost. I would love to do this part of the tour again in English. As we headed into the forest the subject changed to plant life, but this was also also mostly lost on me. 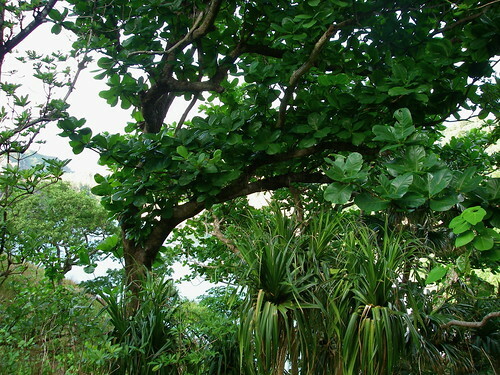 The lushness of the island's flora was easy to appreciate without explanation though. Here is a small collection of treasures found on our hike. 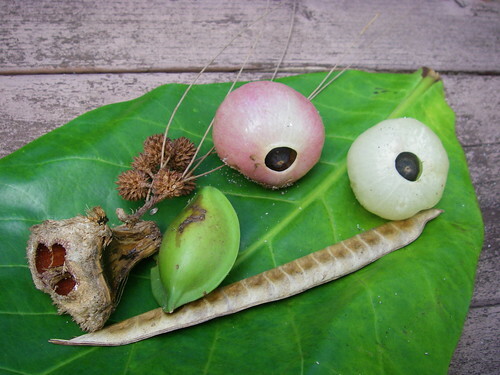 From left: a takonoki (Pandanus boninensis, an endemic tree abundant in Ogasawara) seed husk, the seeds eaten out by birds, bats or rats; some kind of little pine cones; a momotamana (Terminalia catappa, or Indian almond, which is found in tropical regions around the world) fruit; and two hasunohagiri (Hernandia nymphaeifolia, or Jack in the box tree, common throughout the tropics including Hawaii, where the seed is used to make leis) fruit; and an unidentified seed pod. 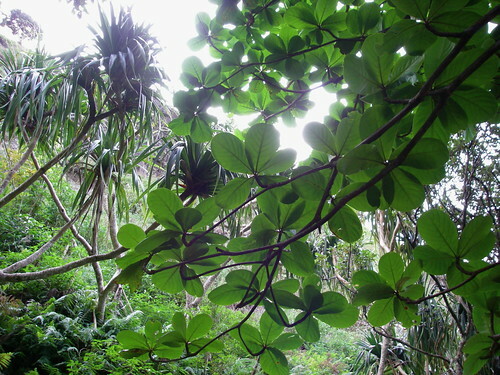 The leaf is from the momotamana tree, same as the green fruit. This little geode is one treasure I really wanted to take, but it was embedded in a rather heavy rock and I didn't want to add to my already overly full suitcase. Our path led us to a lookout with a fantastic view. The sun was starting to set and soon obscured by clouds so I only got a few pictures that showed the beautiful colour of the water, but even under cloudy skies the surrounding ocean and islands were an impressive sight. 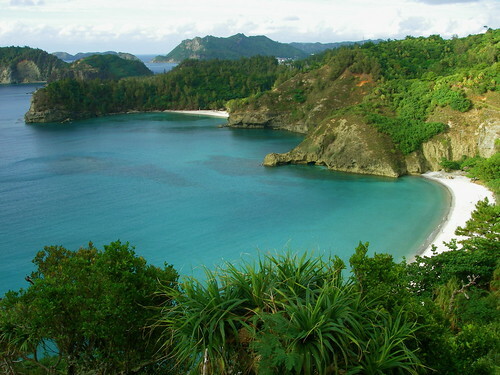 Above is the view to the north, where you can see Kominato Beach, where we'd been earlier, on the right. The beach visible at the top is Kopepe Beach, and beyond Kopepe you can see the entrance of Futami Bay, where we'd arrived that morning. Straight out west the path continued a bit but we didn't have time to go further. We saw off in the distance that the path was already being used by a small gang of goats. Like everyone who colonized tropical islands in centuries past, the original settlers of Ogasawara brought goats with them, since goats are even hardier than people and can thrive in almost any environment, ensuring a supply of meat and milk. These days the goats still thrive but nobody eats them, even though they are said to cause considerable damage to ecology. All us foreigners agreed that a few barbeques and a pot or two of goat curry would be a great solution, but we were told that the goats are actually protected. Which has to be the stupidest thing I've heard in a while, but whatever. Our minds were soon off of goat meat though, as our handlers brought out bags of passion fruit and cut them up for us. 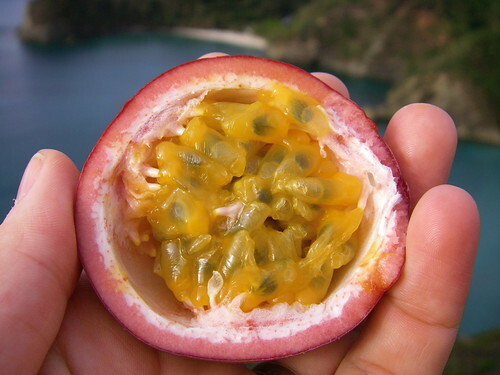 I'd only had fresh passion fruit once before, in Okinawa, and these looked and tasted exactly the same (although they apparently looked a bit different from what the Australians and New Zealanders were used to). They had the loveliest fragrance and a very nice sweet tart flavour, and I loved the contrast of the juicy pulp to the crunchy seeds. 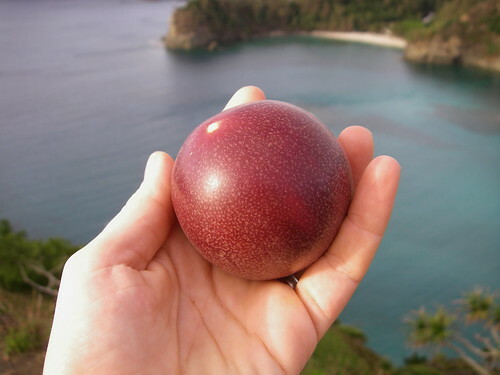 This is a fruit I'd love to see more of in Tokyo but it's quite rare to find, unfortunately. So I ate my fill while I had the chance. I would have been happy to stay and eat passion fruit all afternoon, but the sun was on its way down and we had to get to our next destination. Below is the view south of our lookout, and again I would have been happy to stay to see the sunset (if only we had flashlights for our trip back down the hill). Our next stop was up north of Futami Bay to Mount Mikazuki Observatory, also known as the Weather Station (located at the end of the road on this map). 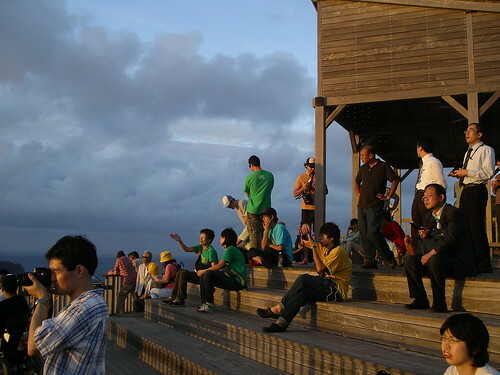 I suppose at one point the place was used to observe the weather but these days it seems to be just a sunset viewing point for tourists. The sunset was as stunning as all sunsets are when seen from tropical islands, and I was just about as successful in capturing it as most amateur photographers are. But if you've ever seen a pretty sunset you can use your imagination here. 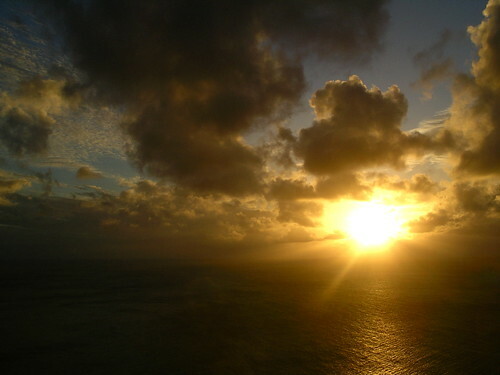 And I'm glad I at least got a picture, as this was the last we were to see of the sun for pretty much the entire trip. The tour over, we were packed back into the minivans and driven to our various hotels. We were divided up and rotated around a few different hotels and inns in order to allow us to experience a variety of places, and on the first night I lucked out and was put up at Horizon (see the J-shaped building on this map), the island's swankiest hotel. Also staying at the horizon were most of the guys, who before we even got to there were passing around illicit beers (some of the guys had managed to snag a six-pack during the tour to celebrate one of their birthdays). We were given a welcome drink upon arrival at Horizon and then shown to our rooms (we each had our own) and then given a bit of free time before dinner, which the boys used to continue their celebrations. I was tempted to join them until I saw my room's giant bathtub and decided to spend my free time soaking away the stiffness and puffiness caused by so much time being cramped cars and ferries the past two days. It was a wee bit lonely to stay in a room by myself but very luxurious, especially after our tiny quarters on the ferry. With all this space and a soothing bath I finally felt like I was on vacation. The room was large and very nice, if a bit bland, and although I took pictures it was too dark for them to turn out well (the pictures above were taken the next morning). 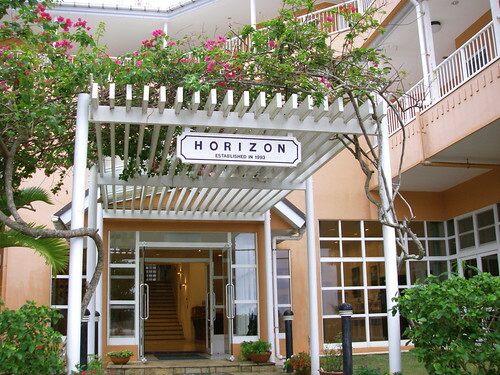 Horizon bills itself as Ogasawara's only "resort hotel", a category whose meaning I'm not entirely sure of, and although I didn't have time to really look around much, I liked it. I would have been convinced it was the best place on the island if it wasn't for the place we stayed at the following night. 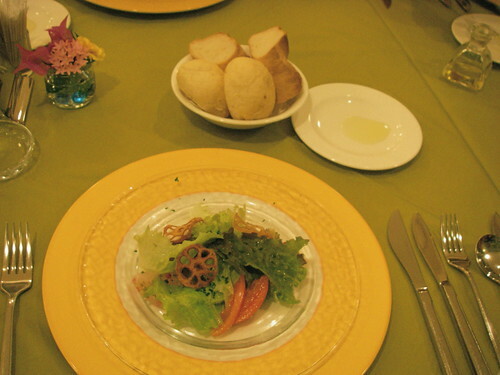 Like most hotels in Japan, a stay at Horizon includes dinner and breakfast. 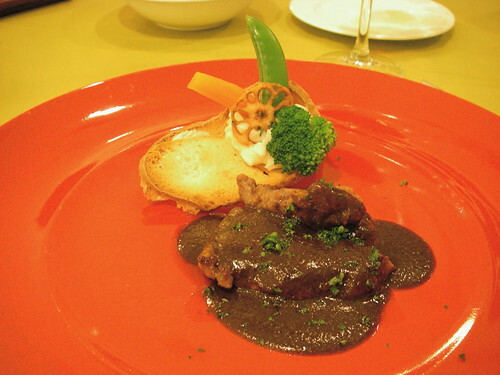 The menu here alternates daily between washoku (Japanese cuisine) and yoshoku (western style cuisine), and today was yoshoku day which for dinner meant a six-course meal with French and Italian influences. The course began with a local fish (some variety of bream, I think) carpaccio salad topped with crispy lotus root chips, above. 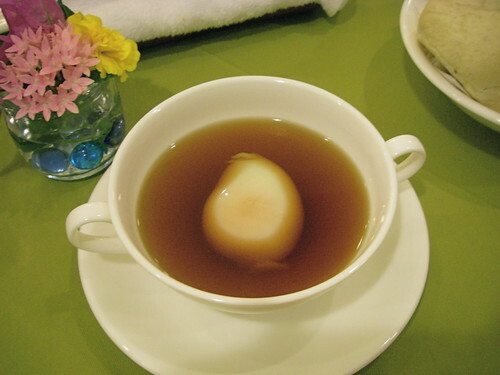 Next was a soup of double consomme with onsen tamago (Japanese style poached egg). This was nice and inventive but the flavour was very strong: afterward I realized we were meant to break the egg first, but out of habit I avoided breaking the egg until the broth was almost gone. 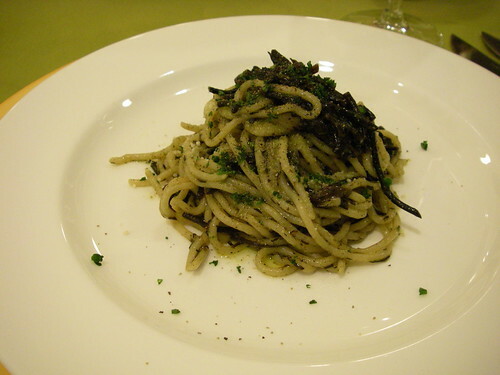 Next was hijiki no peperoncino jikaseimen (handmade spaghetti with olive oil, garlic, hot pepper and hijiki seaweed). I like hijiki and I like pasta so my hopes were high, but alas hijiki just doesn't seem to go with these flavours and this was the weakest dish of the night. 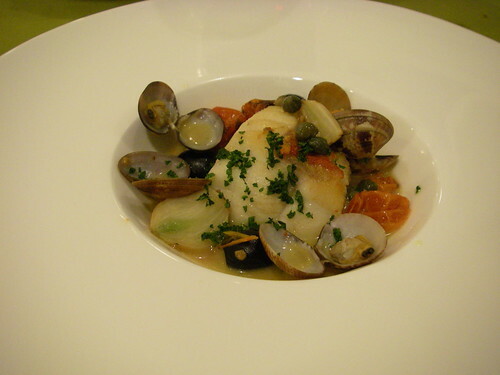 The fish course was shimazakana no acqua pazza (island fish poached Italian style), which turned out to be locally caught kachou (Bodianus perditio, called golden-spot hogfish in English and takibera in mainland Japanese) with clams, olives, capers, garlic and cherry tomatoes. This was very tasty. The mean course was ribeye steak with demiglace sauce with a little sculpture of vegetables and baked baguette slices pasted together with mashed potatoes. The steak and vegetable contraption were both nice but the sauce was a bit bitter. Dessert was homemade gelato and we washed everything down with a few bottles of wine kindly bought by one of the travel consultants accompanying us. It was a nice meal overall and for the average Japanese tourist would have been quite a treat, but as I already eat quite a bit of psuedo-Italian food I couldn't help wishing for something a little more islandy, or at least Japanese. I know what you're thinking, but no, this was not part of our dinner course. As soon as we'd finished eating we were loaded back in the vans and driven inland to the Ogasawara Subtropical Agricultural Center, where we had a night tour. If the weather had cooperated we would have been treated to an amazing night sky, certainly better than I'd ever seen in Japan. Sadly it was overcast so we concentrated on things a little closer to the ground. 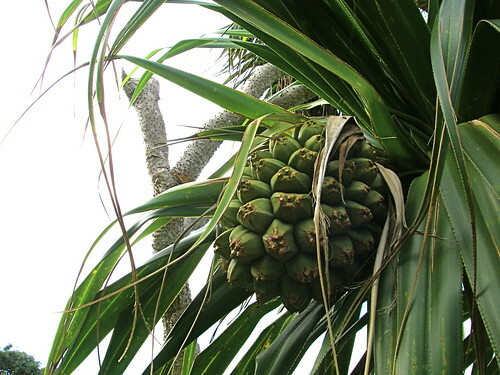 First we saw a few Ogasawara ookoumori (Bonin flying fox), an endemic fruit bat on the critically endangered list, flying from tree to tree looking for fruit (I didn't get any pictures but here is what it looks like). We saw lots of okayadokari (Coenobita, land hermit crab) which are huge and as adults almost exclusively use the shell of the invasive East African land snail. 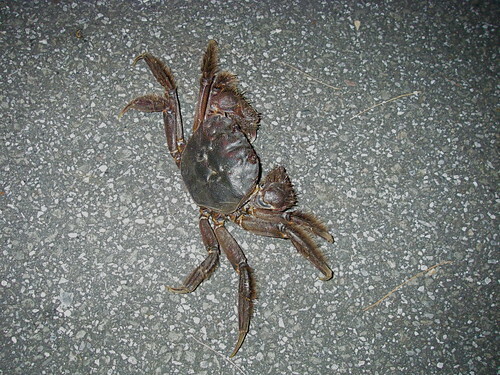 The critter in the picture above is an Ogasawara mokuzugani (Eriocheir ogasawaraensis), apparently called "Ogasawara mitten crab" in English due to the hair on its claws and legs. Finally we spotted, after a long search in the dark, a single green pepe (Mycena chlorophanos), a luminous mushroom that glows an eerie green at night. And that was the end of our first day on Chichijima. See more pictures of my first day in Chichijima here, and here are pictures from the whole trip, and click here for the next post in the series. Such a rich tour...wonderful photos and narrative, thank you for sharing your journey! In 1968 I visited Chi Chi half dozen times on the USS San Joaquin County LST-1122. Loved your photos and commentary. I was present at the ceremony in which Bonins were reverted to Japanese rule. It's good to see that Chi Chi is still beautiful. awesome photo heavy post with excellent commentary. Don't know if I could survive 20+ hours at sea. Nice to know you have been to my homeland of Jamaica. Dina, it really is a beautiful place. Larry, what an amazing place to be posted. Did you guys have an airport back then or did you have to go by ship? Yes, the islands are still beautiful, but the sea turtle population has gone way down. Apparently the only reason there are any left at all is the temporary reprieve they got while the non-turtle eating Americans were in charge. Thanks for sharing your memories. Thank you Jamaipanese! The ferry wasn't that bad (at least on the way there), and I have the feeling it would actually be pretty fun with a big group of friends. I've been to Jamaica five times and can't wait to go again, but I think you'll make it to Japan before I get back to Jamaica. Good luck with your visit Japan plan! It's really great for you to notice the Terminalia Cattapa seed off season and photograph it. The leaves of this luxuriant tree become red and yellow before falling off. 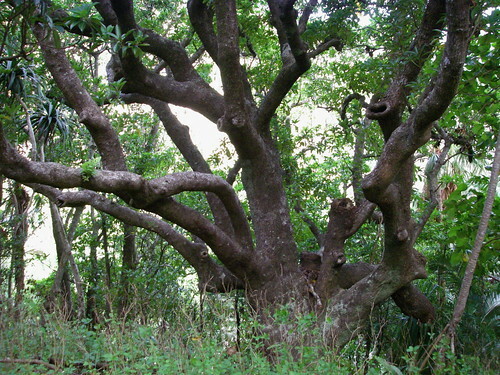 At that time the tree resembles the Maple.The almond kernel inside is eaten mostly by squirrels. 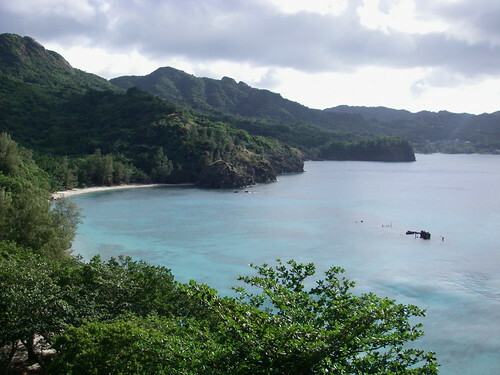 Aside from your wonderful write up and pictures of this place, the island itself looks too colonial for me to visit. Nothing really special as there were hardly any temples or shrine. 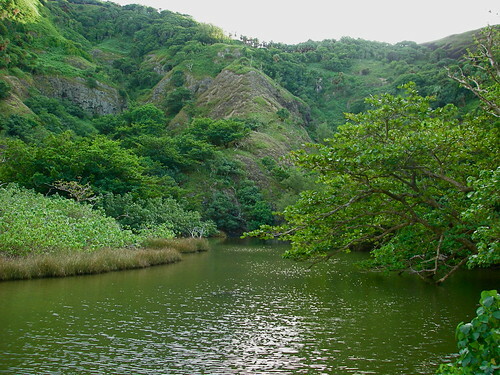 I was also a little disappointed you didn't feature "suppon" snapping turtles which this island is prized for, instead there was Western food, stuff I could make in my own kitchen. 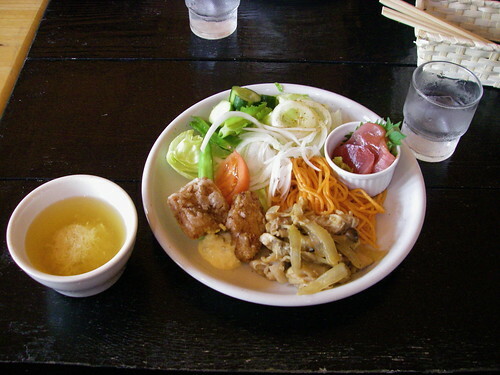 Not enough familiar Japanese cuisines like most prefectures feature. Aurore1, I actually got to try the nut inside a few days later when we found older seeds. It was pretty tasty, and apparently once upon a time the island kids ate them for snacks. 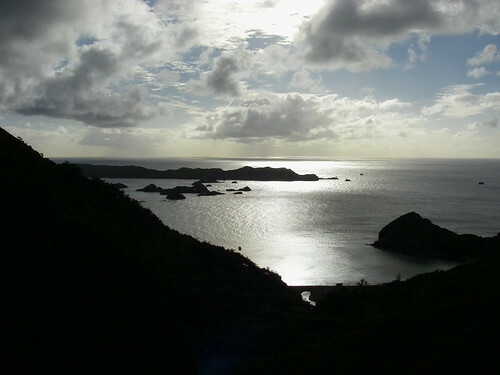 SoulofJapan, there is no suppon on the islands. 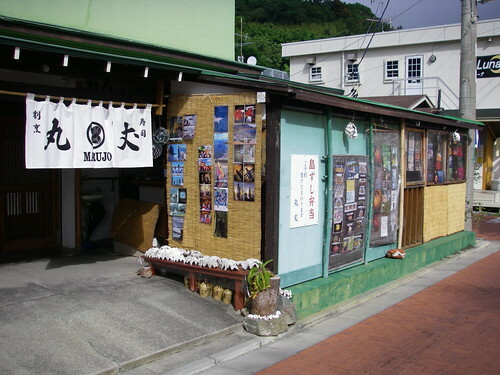 Ogasawara is not a prefecture, it is part of Tokyo, and what we ate was was pure Tokyo cuisine. I think I mentioned myself how disappointing the lack of a special cuisine was. Tasty and beautiful. The best pictures in the world.